The 2013 is here and its an exciting time for inviting new ways of living in. This is time to indulge in new ways of thinking and starting fresh, even thinking big! I have a feeling that this year will be a POWER YEAR – the year to really shine, get out of our comfort zones and expect miracles (and I am not being metaphoric here). I sense that a lot of us will be fully stepping into our true purpose as women, and nurturing teachers for the people around us. This is the year to really connect with what I call Your Inner Goddess – the part of you that is clear on what she want from life, she trusts life and her ability to attract all she desires. She know she deserves the best. She is calm and confident, full of life and radiating an energy that is irresistible to those around her. 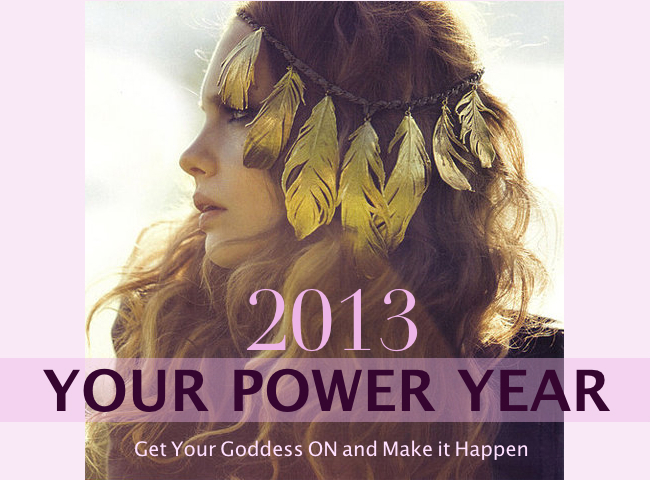 So GET YOUR GODDESS ON in the new year and let her guide you on the journey of creating the life you love. What is the your vision for the year ahead of you? What do you want to invite into your life next? If you could make only one significant change that would improve the quality of your life dramatically, what would it be? Start taking care of your body better? Maybe you always wanted to write a book or start your own blog about baking. Maybe you just want to take more time for your self to enjoy life and “smell the roses” in the new year. And I want to stress that the size of your goal does not matter. Sometimes the smallest but consistant changes we’ll create are the ones that eventually cause the biggest breakthroughs. In fact, often committing to huge goals (or as I say trying to make a quantum leap) is what causes us to fail, get discouraged and go back to our old ways resulting in getting stuck and feeling frustrated again. So think small consistant changes that you can maintain when choosing your goals for the next year. And if you have a big goal in mind, think small steps and concentrate on those one at the time as you move along towards the big picture. It doesn’t matter what is the change that you desire to make, you will need to do one thing for sure to achieve any of these golas – small or big. YOU will need to change as a person. The person you are or were can only have what you have right now, so if you are ready for an “upgrade”, it’s time to upgrade your blueprint for manifesting. What is your blueprint for manifesting? From my experience as a Life Coach and a person who likes to set goals and dream big, I know that we dont’ attract what we want, we attract WHO WE ARE. Our personality and our belief system is the blueprint for the reality we manifest each day. No acception. Keeping all this in mind, here are 3 things I suggest you let go off in the new year to make easier to attract new wonderful things and opportunities into your life – personal or professional. Giving up these 3 things will power up your manifesting ability and will allow you to create changes faster, with less effort and most importantly, it will allow the changes to stick. First time I have ever heard about this concept was a few years ago while listening to a youtube video of Wayne Dyer talking about this profound shift in mentality. What he means by asking us to give up our personal history? He means: we are not what happened to us in the past, we are not the mistakes we have made or the stuff we have accumulated (or not yet accumulated). Many of us have the habit of defining our selves by our past, what we have achieved so far or failed to achieve. From my experience as a Life Coach I have learned that people tend to really hang on and keep re-living the stories of failed relationships, tough childhoods, missed opportunities, or other regrets. What are the stories that you commonly tell about your self? These could be things like I have always been shy, I was raised to…, I never …, I tend to…, my experience is…., I have never been good at…. These stories we tell about our selves don’t allow for new opportunities, and actually function as manifesting blogs preventing us from growing and receiving more from life. One of my favorite quotes of all times is: there is no failure, there is only feedback. Our past can be a powerful teacher instead of our enemy and a reason to hold back, doubt our selves, and even beet up on our selves for months and years at times. What if you could give up your personal history, as Wayne Dyer suggets. What stories would you be letting go off? What are the most hurtful, shameful stories that still have the power to define you as a person, hanging over your head constantly like a dark cloud? 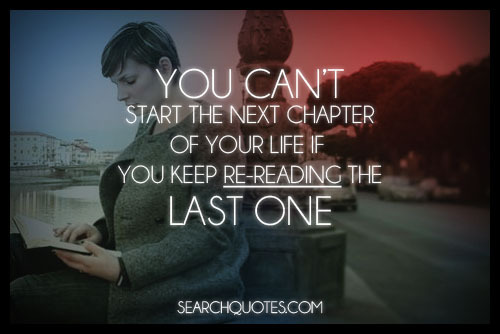 Take inventory of your past. What is due to be left behind and released to make room for brighter future? In next few days, take some time to take inventory of your past and identify your stories of shame, gilt, anger and failure. This time don’t wrestle with them, trying to understand why people would treat you this way, that is a bottomless pit you will always be loosing energy to. I suggest this: Accept them – good or bad. Just start the process of making peace with how you handled things in the past. Maybe you didn’t know any better, you were too young, you needed to learn some powerful lessons and unfortunately this is still the lost common way to learn for us – by making mistakes and adjusting our approach when we try again. I even suggest even to start loving your self for having the courage to make mistakes, pick up the pieces an move on. Start the New Year with a new way of defining your self, watch your self in conversations with others and start consciously stopping your self before you tell another story that disempower you and prevent you from stepping into your most confidant, capable and inspired self. Set your self free and let the past drift away to make room for bright future. I remember years ago when I was working with my first Life Coach, she paused a question that I will never forget. She asked: “Erika, what if things just fell into your lap?”. My first, natural reaction was ” What?” It felt like she was speaking spanish to me. I grew up in a culture (I grew up in a little village, in Eastern Europe) that prides it self on working hard and having to deserve every little thing. The idea of things being easy and “falling into my lap” was something that din’t really cross my mind at all. That Coaching session was a real breakthrough for me. I started to wonder, does it have to be so hard? At that time I was working as a nanny, constantly felt overworked, exhausted, and wondering why I am not getting more back for my efforts. As I mentioned above, our believe system is the blueprint for how we manifest our reality each day. I believed, I had to work hard for every little thing and my reality was reflecting that belief to my self. Nothing is easy. Life’s hard. Easy come, easy go. Nothing ever comes that easy. Nothing worth having comes easy…and the list keeps going. This way of thinking has been passed around for centuries as wisdom and we just got use to it, bought into it and now even consider this to be THE SMART WAY of thinking, keeping us save, prepared for the time the other shoe will drop. Do you find your self talking/thinking about life this way? Quit it! Seriously! Quit it! It will come back to you like a bumerang you can trust to come back to where it came from, bringing experiences into your life that will perpetuate this vicious cycle. I see this over and over again, when I work with my clients. Somehow we are wired to over-think and complicate things, expect things to be hard to get, hard to achieve. Everything has to take a long time, lots of work, energy, money…In the last few years I have learned that these beliefs are just plain silly, an unproductive way of processing life and a sure way to get overwhelmed and exhausted even before you we approach new opportunities. The first step to overcoming this unproductive mentality is to be open to things becoming easier actually. Years ago I worked for a very successful business man owning a restaurant I worked in, and the first thing I have noticed about him was his mantra: “Things have a tendency to work out”, always spoken in a calm manner. Guess what? Things always somewhat worked out for him. Do you tend to overcomplicate things? Did you already make peace with the idea that you need to get exhausted before receiving the benefits of your effort? I suggest that you reconsider this idea and start trusting life more, be open to a change that will energize you. Also, watch your mantras. Is your language helping you to get where you going faster or it it inviting more trouble in and building obstacles in your way? Everything is figure-outable. This is Marie Forleo’s quote that I love. Great mantra! There is always a simple solution available. I just need to breathe, relax and allow for things to fall into place. The universe is on my side. I am open to thing being easy/easier in my life. I am willing to change and allow the universe to support me in any way possible to achieve my goals with ease and grace. Things tend to work out for me. I keep things simple and allow the universe to take care of the details. I have expressed my love for simplicity in my article I wrote last year in January when I was setting my intentions for the year ahead. If fact, I declared the 2012 to be the Year of Simplicity for me. I am going to stick with this attitude as I am really enjoying the benefits – less stress, more productivity and my migraines became very rare. 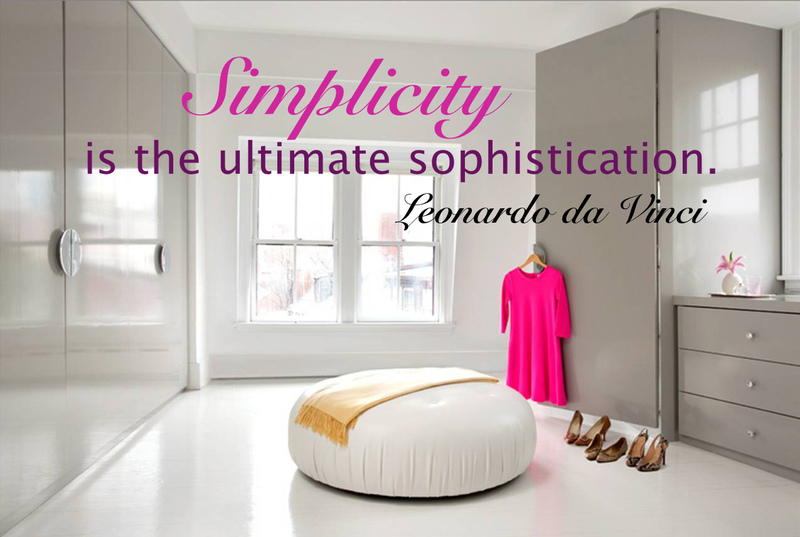 Here are more ideas on implementing simplicity into your life. I know many people that pride themselves on being multitaskers, in fact I was one of them. Today, we live in HYPER-PRODUCTIVE world that puts us on crazy busy schedule and multitasking is one way of coping with this stressful way of living. As productive as it may seam, it’s a bad habit that is reflecting on a very disempowering belief system. Studies shown that multitasking is not more productive—it just makes us feel more emotionally satisfied about our work. Here is a great article, that talks about this fact: What Multitasking Does To Our Brain. Women are known to be masters multitaskers, but I have noticed that it’s often because we have a tendency to try to fill Superwoman’s shoes, pleasing an army of people at ones, not having clear priorities which includes putting our selves, our health and sanity first. When we try to keep up with this Hyper-productive mentality, we pay a high price for it. Our health often suffers due to the stressful, overwhelming schedule allowing for little relaxation and time to re-charge. We may experience constant exhaustion, and as we get addicted to doing more at the same time, we may loose our ability to truly prioritize. We can loose our ability to stand still and give our full attention to what really matters, which can really hurt our relationships – personal or professional. The quality of our lives is defined by the quality of our relationships and multitasking allows for very little opportunity to create a meaningful, mindful connection with the people around us. Be putting our addiction to feeling productive first we may miss on opportunities to create the most satisfying and life-changing relationships. 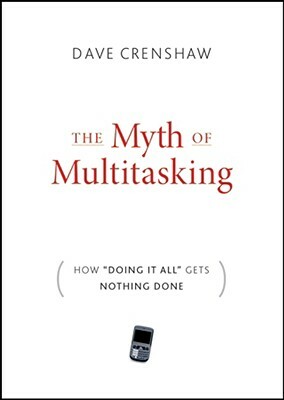 Here is a great article on the Myth of Multitasking exposing the fact that we are actually biologically incapable of processing attention-rich inputs simultaneously. So even our bodies and the way we are build physiologically doesn’t support this approach to life. 1. It is scientifically proven that multitasking is not an incredible ability to do number of things at the same time, it’s just us an ability to switch our attention from one thing to another frequently. In other words: it’s the oposite of being present and fully focused which is the only way to tap into your manifesting power, intuition, and resources not available to us when we are constantly distracted. 2. Multitasking is a reflection on limiting beliefs like there is never enough time, I need to to make sure everyone is happy (which is not only impossible but also dangerous mindset to develop). As I mentioned above, our belief system is the blueprint for the way that we manifest our reality. Be giving into these limiting beliefs we can create a life in which we end up chasing our own tale in the search for happiness based on the wrong values. 3. If you find your self anxious and agitated at work or anywhere else, check in with you to see if you are multitasking. There is a good chance you are. The worst part is that we attract everything into our life through our own energy and the when we feel anxious we are in a state that is a manifesting block for creating enjoyable, positive, empowering experiences. Single-tasking is a new trend that is becoming popular thanks to people like Tim Ferris, Dave Crenshaw, Marie Forleo and many others that are aware of the power of being present, fully focused and able to only give your attention to what is truly contributing to better quality of your life. I invite you to join this movement, slow down and re-connect with your calm, confidant and most productive self. May it be filled with love, peace, happiness and prosperity in your personal and professional life! Dream big and trust your self to have the power to create an amazing life for your self. Alisha is one of my favorite inspirations when I need to tune into my calm, powerful Goddess self and this song is a great way to start a day when you need to remind your self of what an amazing, beautiful woman you are. Happy New Year, Erika! Thanks for the great newsletter. And I love the new look on your website! It is so beautiful and full of wonderful resources. I really agree with you about the three things to give up you suggested here. Great article! Hello Mizuho! Thank you for your kind comment. I am very proud of the work I have done to re-launch my site and I am happy you enjoyed the article. This is an important time of the year and all of us need all the strength and courage we can gather up to make the exciting changes we dream about. Any tools that we can implement now that help us to move forward with confidence are worth trying. I hope that this article with help my readers to create healthier and more effective mentality in the new year. Hi Erika, I saw your comment at Marie Forleo and decided to stop by. Now I cant’s stop reading your articles. 🙂 I really like your point of view and these amazing ideas. I definitely need to work on these things. I am pretty sure than can make a huge change. Thanks once again! Thank you for your comment! I am happy you found this article helpful and thank you for visiting my site. I hope you will have an amazing power year! 🙂 Anything is possible when we are willing to embrace change.